Thousands of people gathered Friday for a mass funeral in a cemetery in New Zealand where 26 of the 50 victims of a mass shooting at two mosques last Friday were buried. The youngest victim buried was 3 years old. Family members used shovels and wheelbarrows to bury their loved ones. Earlier Friday, thousands of New Zealanders gathered in a park across from the Al Noor Mosque, where one of the attacks took place, to observe the Muslim call to prayer, including Prime Minister Jacinda Ardern, who wore a black headscarf. Thousands more watched or listened on television or radio as the event was broadcast live. New Zealand mourns with you. We are one, Ardern said in a short speech, followed by two minutes of silence. Imam Gamil Fouda told the crowd, We are broken-hearted, but we are not broken. He thanked the neighbors who opened their doors to save us from the killer and those who pulled over their cars to help us. Also Friday, New Zealand Deputy Prime Minister Winston Peters traveled to Istanbul for an emergency session of the 57-member Organization of Islamic Cooperations executive committee. The meeting was called by Turkey to fight prejudice against Muslims in the wake of the New Zealand attack. Peters told the assembly that the gunman accused of the killings would spend the rest of his life in isolation in prison and promised that the families of the victims would have justice. The OIC, in a statement, urged all countries to refrain from statements that associate Islam with terror and extremism. Turkish President Recep Tayyip Erdogan said the world must fight against rising Islamophobia in the same determined fashion as humanity fought against anti-Semitism after the Holocaust. During his campaign rallies, Turkeys president has been showing video clips of the mosque attacks, which were livestreamed by the shooter, drawing condemnation from New Zealand and Australia. Peters told reporters that he did not ask Erdogan on Friday to stop showing the videos, because I felt that I did not have to ask it, because they are not doing that anymore. However, several hours after the meeting, Erdogan again showed video footage of the shootings during an election rally. 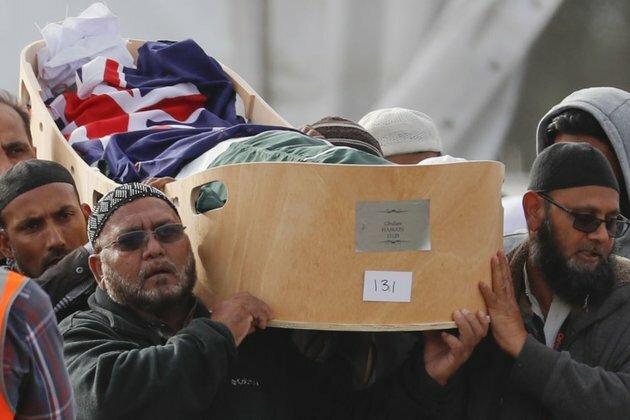 New Zealand authorities have charged Australian Brenton Harrison Tarrant, 28, with murder in connection with the March 15 attacks on the Al Noor and Linwood mosques. The self-proclaimed white nationalist did not enter a plea in his initial court appearance the day after the attack. His next court appearance is April 5. The ban, which the prime minister announced in Wellington, includes high-capacity magazines, which can hold multiple rounds of ammunition, and accessories that can convert ordinary rifles into fast-acting assault rifles. Ardern said she imposed the sales ban to prevent stockpiling and that a complete ban on the weapons would be implemented after new laws take effect. Ardern also announced a large-scale buyback scheme to encourage owners of such weapons to surrender them to authorities. She said the government could spend up to $140 million to buy back guns from owners who turn them in. The military and police would be exempt, as would pest control businesses. New Zealand police said on their website a transitional period would allow people to turn in their guns without penalty. Parliament is expected to approve the proposed laws when it reconvenes in mid-April.